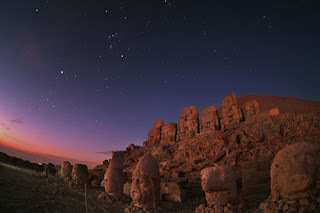 Astronomy Lover: Special, Magnificent and Gorgeous Constellation in Winter ! 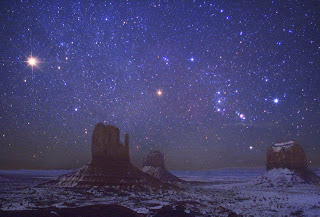 Special, Magnificent and Gorgeous Constellation in Winter ! I am going to introduce a constellation that everyone should knows in winter! Since we all know that in Greek mythology, Orion was stung to death by scorpion. Of course, Orion would afraid scorpion ever after. So that is the reason why he is placed in the sky opposite Scorpius. Orion sets, then the scorpion rises. Orion is one of the most glorious constellations. He representing a giant hunter or warrior by his dogs( the constellations Canis Major and Canis Minor ). 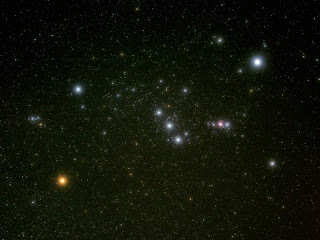 Orion's belt is the most distinctive feature. It is a line of three second-magnitude stars. Also, there is still some beautiful things I want to show you! 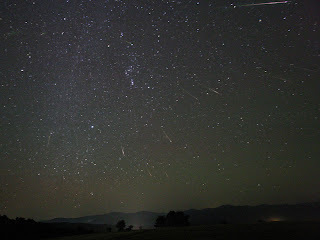 By the way, in the late October each year, the Orionid meteors appear to radiate from a point near the border with Gemini. It is not very difficult, right? Hope you not only enjoy the beautiful pictures but also walk out and observe it! Want more information? Just click and enter the website, click"search" and type "Orion". 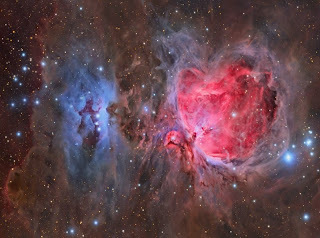 It will provides you so many pictures about Orion and gives plenty of information.